WINONA LAKE – The Grace College Athletic Department will induct four members into the Lancer Hall of Fame on Saturday morning: Steve Coverstone (men’s golf) Andrea Bustamante (track and field), David Diehl (men’s soccer, track) and Karen DeVries (cross country). The 2017 induction class is Grace’s 10th class. The group will be honored at the annual Hall of Fame Breakfast on Saturday at the Manahan Orthopaedic Capital Center. Coverstone was a pioneer for Grace’s golf team, playing from 1974-79. He was one of the first standout golfers in program history and even won the Valparaiso Invitational in 1978. He served as the team’s captain and was elected MVP throughout his career at Grace. 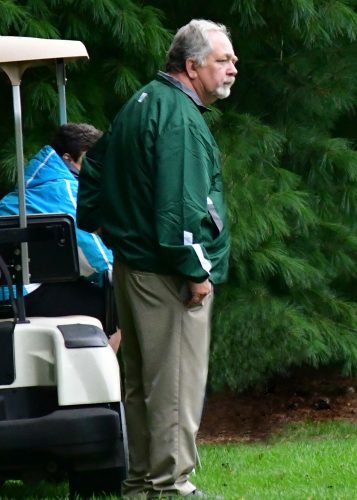 Coverstone currently serves as the girls and boys golf coach at Wawasee High School, widely regarded as one of the most successful coaches in WHS athletics history. Bustamante excelled at track for Grace from 1998-2002. She won two All-American awards from the NCCAA in 1999 and 2001, and she was a three-time All-Conference honoree. The sprinter was part of four conference winning events, claiming the 400-meter hurdle crown twice and winning two 4×400 races. Diehl was an elite soccer and track/field coach for Grace. In seven years, he won 84 matches for the Lancers’ soccer squad. In 1982 he led the Lancers to the school’s first appearance at an NAIA National Championship. In 1983 he was named the NCCAA National Coach of the Year. He also coached Grace’s track and field squad to a conference championship in 1984. DeVries is one of the premier cross country minds in the state of Indiana. She has already been elected into the Indiana Track and Cross Country Hall of Fame after coaching Valparaiso High School to five state championships. At Grace, she was an accomplished runner as a two-time NCCAA All-American. DeVries also qualified for the NAIA National Championships in 1984 and 1985. The Hall of Fame Breakfast begins at 9 a.m. The inductees will also be honored at halftime of the men’s soccer Homecoming game, which starts at 2 p.m. To purchase Hall of Fame Breakfast tickets, call Grace’s athletic office at (574) 272-5100 ext 6266.